Moving our SAP HR systems to AWS and implementing a ‘cloud first’ policy allowed us to focus on our growing business, instead of managing infrastructure. RWE Czech Republic (RWE CZ) is a Prague-based energy company with multiple subsidiaries. These include RWE Energie, which is the leading gas company in the Czech Republic, and RWE Gas Storage, the biggest underground gas storage operator in the country. RWE CZ is part of RWE Group, a Europe-wide organization that offers a comprehensive portfolio of products and services spanning all stages of the energy value chain. RWE Group has 60,000 employees, serving 16 million electricity customers and eight million gas customers across European markets including Germany, the U.K., and the Netherlands. RWE Group revenue in 2015 was EUR48.6 billion (US$53.5 billion). With a rapidly growing business, the RWE CZ data center based in Brno was struggling to keep pace. It was expensive to scale, time-consuming to manage, and didn’t provide the flexibility that staff required. By 2013, the CEO of RWE IT, Michael Neff, had a clear vision of the type of IT infrastructure he wanted to create. The two principles of “manage, not make” and “cloud first” would form the basis for the organization’s IT strategy, both in the Czech Republic and across the parent group’s other operations. RWE CZ decided to move its SAP HR system to the cloud first. It was running on an Oracle DB 11g on Power/AIX, and is used to process the monthly benefits for about 4,000 employees. Given the sensitive nature of the data handled and RWE’s stringent data protection policies, compliance certifications—for example, ISO 27001 and ISO 9001—were vital in any technology that RWE chose. The team wanted to find a cloud technology that would enable it to run applications cost-effectively and help it transition from the management-intensive data center infrastructure to agile services that would support company growth and performance peaks. With its ISO-compliant, pay-as-you-go offerings, Amazon Web Services (AWS) was a good fit for RWE’s needs. Working with local partner T1-Solutions, RWE CZ used AWS to design and build a lean, secure, and highly available architecture to run the energy firm’s SAP HR system. 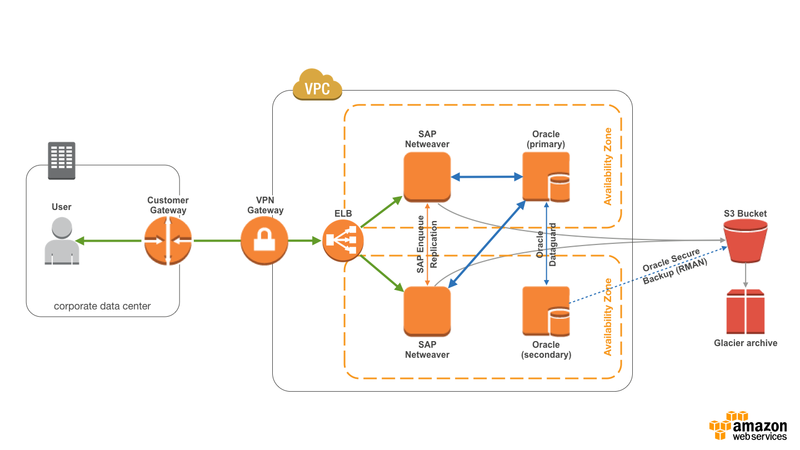 Using Amazon Virtual Private Cloud (Amazon VPC), the team built a stable, encrypted connection between the existing data center and the AWS cloud. Elastic Load Balancing automatically routes requests to the most appropriate Amazon Elastic Compute Cloud (Amazon EC2) instance. Oracle Enterprise Edition runs on Amazon EC2, with Oracle Secure Backup providing database backup, restore, and recovery capabilities. These backups are initially stored in Amazon Simple Storage Service (Amazon S3), and later on moved to Amazon Glacier for durable, ultra-low-cost storage. The diagram below illustrates the RWE CZ architecture on AWS. By using AWS, RWE CZ has implemented an agile, cloud-first approach that is central to its plans for growth. Having successfully moved its SAP HR solution to AWS, RWE CZ has cut its operational expenses by 12 percent compared to running the system on legacy on-premises hardware. It also reduced its physical data center footprint, which is helping to make the firm more energy-efficient. AWS compliance certifications for ISO standards help RWE CZ ensure that its sensitive data is secure at all times. The project has also proved that the company’s data is safe in the cloud, paving the way for the migration of other RWE CZ mission-critical systems to AWS. RWE CZ is taking full advantage of the flexibility that working in AWS provides. It no longer has to provision hardware and, as a result, it can deploy software and resources in one day compared to six to eight weeks in the past. This enhances the service it provides to the business, gives employees faster access to applications, and helps improve productivity across the organization. With the successful migration of its SAP HR system, RWE IT has a blueprint for extending its use of cloud services and ensuring that other parts of its business can benefit from the high capacity and flexible provisioning of AWS. RWE CZ is on track to migrate all its systems to the AWS cloud by the end of 2016. Learn more about running SAP on AWS.